CARYOPHYLLACEAE. 'PINK'. A large genus of mostly hardy perennial herbs prized for their rich, showy, often fragrant flowers. Favorites among old-fashioned flowers, they are easily grown, mostly tufted or mat-forming evergreens. Excellent in the border, pots, rock garden, and glasshouse. Some are good for cutting. They like warm, rich, well-drained soil. The species often self-sow. The annuals should be sown as early as possible, but the perennials may be sown anytime up to August for a good show of bloom the following season. Full sun or part shade. Shear after bloom, and never cover the tops with mulch; snow is the best protection. Likes lime, use limestone freely, but not very high-magnesia lime. Sow shallowly, the annuals sprout in 5 - 10 days, the perennials up to 3 weeks or so. Seed viable up to 5 - 10 years or more. All are Zone 3 unless noted otherwise. Alpine Dianthus seed like a brief chill, just a few days is enough to produce the best healthy seedlings. 'AMUR PINK'. Unusual lavender-blue fringed flowers borne over a long season. Hardy perennial to 10". Narrow leaves. Amur region of Siberia. Zone 3. Give good drainage. Germinates in 1 - 3 weeks. White, fragrant, deeply fringed, inch-wide flowers on 3" stems in summer. Hardy perennial with grey-green foliage in 12 - 18" mounds. Eastern Europe to Finland and W. Asia. Zone 3. Germinates in 1 - 3 weeks. Dwarf form to only 6" tall, with pure white fragrant deeply fringed inch-wide flowers in summer. Hardy perennial forming compact mounds of blue-green foliage. Zone 3. Choice! Germinates in 1 - 2 weeks. The darkest of all, with fragrant deep maroon, nearly black petals and scarlet throats, in dense clusters in summer. Upper foliage marked purple. Hardy perennial to 14". Zone 4. Germinates in 1 - 2 weeks. 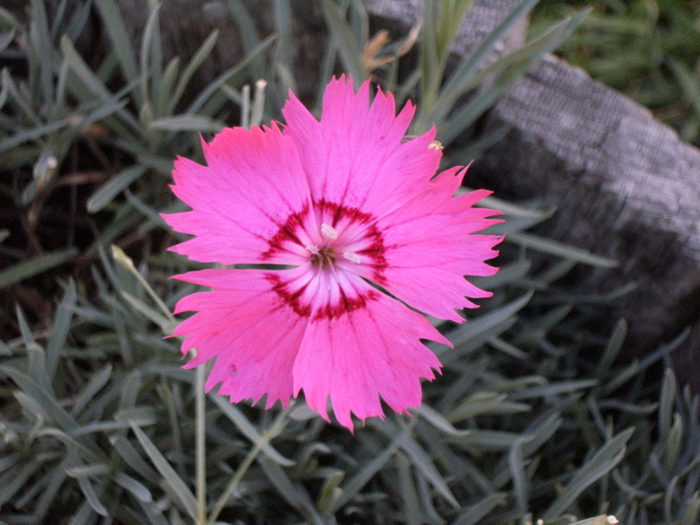 'SWEET WILLIAMS'. A nice blend of white, crimson, salmon, violet and white, with dark-eyed and edged forms. Hardy annual or biennial to 20". 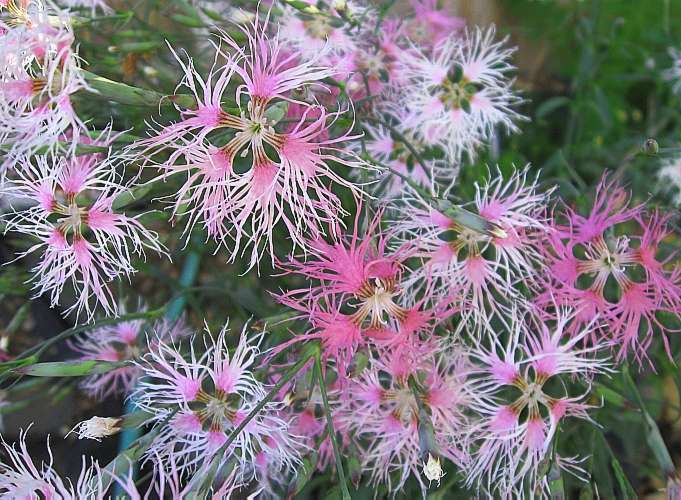 'CLUSTERHEAD PINK'. Magenta flowers in clusters of up to 50 blooms, on upright stems to 2 - 3 1/2 feet. Hardy, wind-resistant perennial with narrow, grass-like leaves. Europe. Zone 3. Blooms continuously from June to frost. Germinates in 1 - 4 weeks warm. Blood-red 3/4" flowers in dense clusters in summer. Hardy perennial to 1 - 2 feet. Balkans. Germinates in 2 weeks. White flowers with a brilliant red eye and toothed petals, on 8" stems. Hardy mat- forming perennial with green turf-like foliage. Zone 3. Germinates in 1 - 2 weeks. 'MAIDEN PINK'. Clear pink 3/4" fragrant flowers with toothed petals and 8" stems. Mat-forming hardy perennial with light green turf-like foliage. Eurasia. Zone 3. "One of the prettiest border pinks."—Bailey. 'CHEDDAR PINKS'. 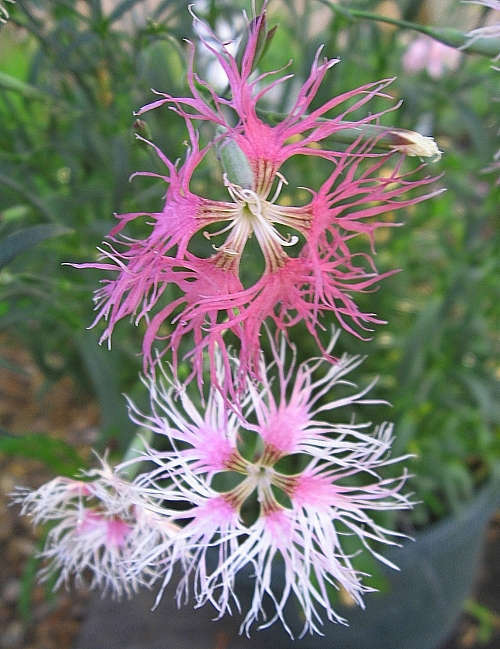 Very fragrant fringed flowers in showy shades of rose, in May and June. Mat-forming hardy perennial to 8", with cushiony mounds of blue-grey foliage. W. Europe. Germinates in 1 - 2 weeks warm. Rich sulfur-yellow flowers in clusters above the downy, grey-green foliage. Hardy perennial to 16". W. Yugoslavia. Germinates in 1 - 2 weeks. 'COTTAGE PINKS'. Large, double, spicily fragrant flowers in varied shades. Old fashioned hardy perennial to about 18", forming mats of blue-green grass-like foliage. Blooms June to October. Austria to Siberia. "Charming, almost legendary plant, cultivated for hundreds of years."—Sunset. Stunning lilac to rosy purplish 1 1/2 - 2" wide highly fragrant flowers, the petals deeply fringed, in lax clusters to 1 - 3 feet tall. Hardy perennial. N. Eurasia. Wonderful and extremely hardy. Germinates in 1 - 2 weeks. "Things are not always what they seem."—Phaedrus. FUMARIACEAE. Hardy perennials valued for their attractive much-cut foliage and oddly-shaped flowers in shades of red yellow and white. Easily grown in shady parts of the border or wild-garden. Seed needs 6 weeks plus cold treatment to germinate in 30 days or so. 'PACIFIC BLEEDING HEART'. Rosy purple to pink 3/4" heart-shaped flowers in graceful 9 - 30 flowered racemes. Hardy perennial to 6 - 24", with attractive ferny foliage. Moist areas, B.C. to central California. Good in part shade, blooms late spring or summer, often reblooming later. Zone 3. Variable dormancy, try 4 - 10 weeks warm followed by 12 weeks prechill, or sow in fall. GA-3 may help. LILIACEAE. Western North American cormous plants with grass-like leaves, much like Brodiaea, but with dense umbels. Best in mild climates with wet winters and dry summers. In summer-wet areas they like a sandy, well-drained soil. Nice in pots. 'FIRECRACKER FLOWER', 'IDA MAY'S LILY'. 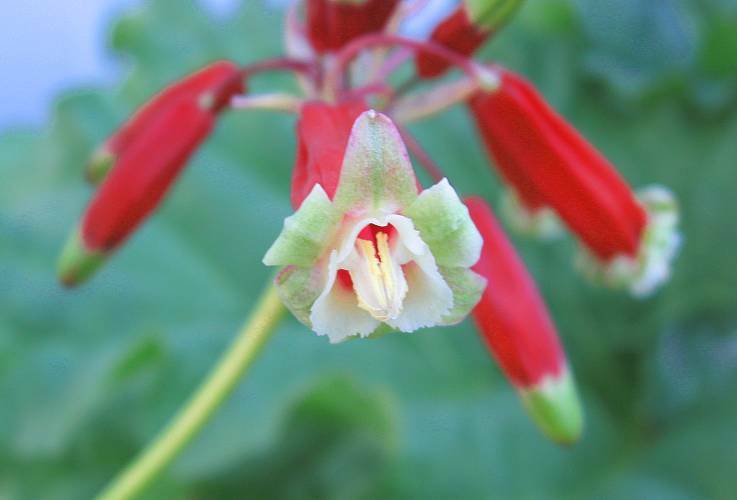 Bright scarlet inch-long tubular flowers with white tips, on 1 - 3 foot stems. Half-hardy bulb with grass-like leaves. Northern California. Zone 5. Germinates in 8 weeks at cold temperatures. RUTACEAE. 'DITTANY', 'BURNING BUSH', 'GAS PLANT'. An old garden favorite, grown for its showy flowers and the strongly lemon-scented foliage. Good cut flower. Makes bold upright clumps to 2 - 3 feet, with glossy foliage. Best in rich soil and full sun or part shade. Drought resistant. Dislikes transplanting. Sow in fall or give 3 months cold treatment for high germination. Plant 1" deep, as seed 'floats'. "Established plants will bloom in their third year from seed. By the fifth year they are heavy bloomers... Will live over 100 years, and is geared for tough conditions. It is rabbit and deer proof. Cut flowers last 2 weeks."—P. Pinnow. May cause rash in sensitive people. 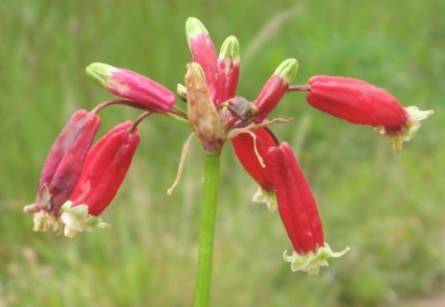 The name comes from the peculiar property of giving a flash of light if a match is held under the flower cluster, near the stem, on hot, still summer evenings. Very long lived—"Instances are known in which it has outlived father, son and grandson in the same spot."—L. H. Bailey. 'PINK BURNING BUSH'. Pink inch-wide flowers. A fine variety. Eurasia. Zone 3. IRIDACEAE. Several South African cormous herbs, grown in warm areas for their beautiful flowers. Similar to Sparaxis and Ixia. 'FAIRY WANDS'. Dark purple bell-shaped 1 1/2" flowers in spikes, on arching stems to 5 - 8 feet tall. Stiff sword-shaped leaves. South Africa. Zone 7. Germinates in 4 - 6 weeks warm. 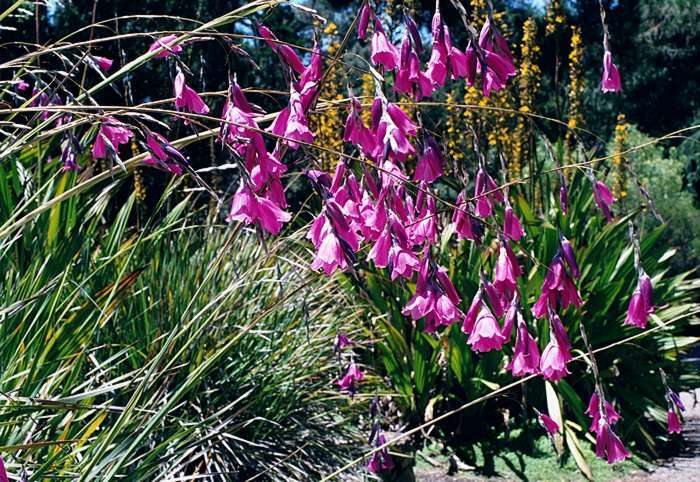 Nodding bell-shaped 1 1/2" flowers in shades of red, pink, purple, and lavender, held on long arching stems. Compact plants to 3 feet. South Africa. Zone 7. SCROPHULARIACEAE. 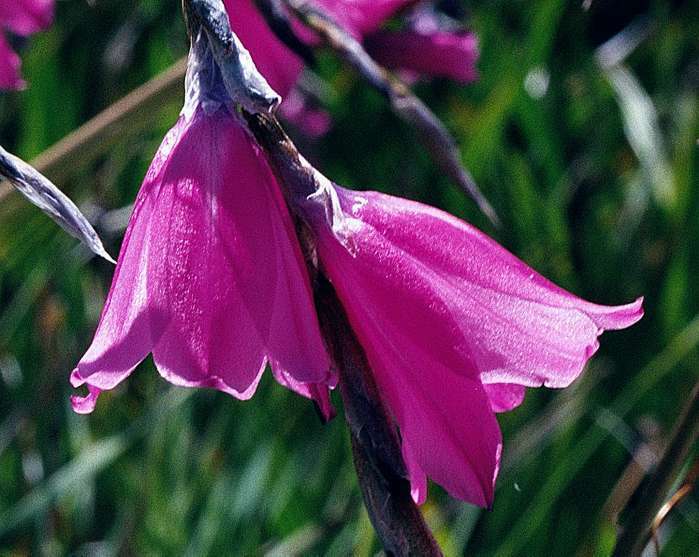 Showy old-fashioned Eurasian biennials and perennials, grown for their attractive spikes of bell-like flowers. Attracts hummingbirds. Easily grown, self-sowing. Cut main spikes after flowering to prolong bloom. All are Zone 3 unless noted otherwise. All germinate 2 - 3 weeks warm unless noted otherwise. 'RUSTY FOXGLOVE'. Rusty-red, downy flowers in long dense spikes. A striking hardy biennial or perennial to 3 - 6 feet. S. Europe. Zone 3. Germinates in 2 - 3 weeks. Exceptionally large pure yellow flowers from June to August. Hardy biennial or perennial to 5 feet. Zone 7. A very nice form. Germinates in 1 - 2 weeks. 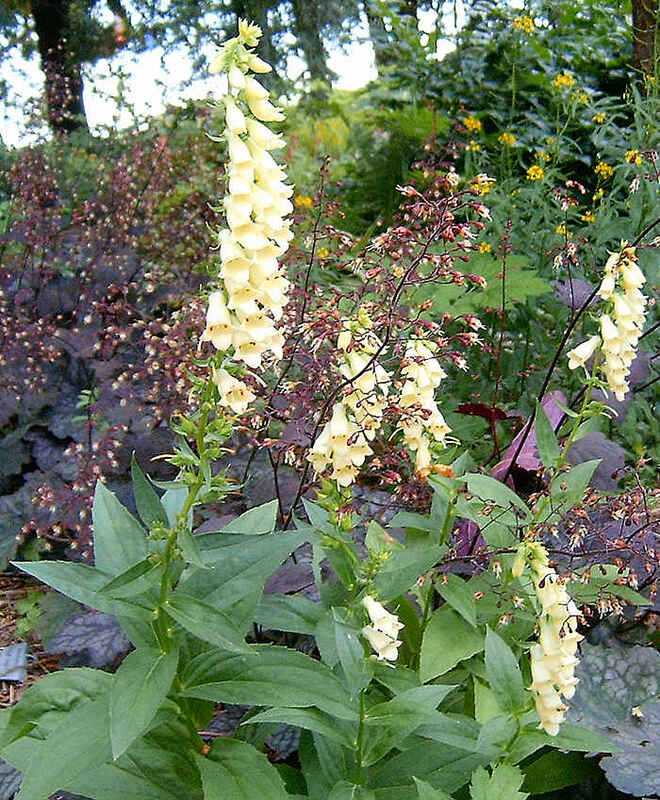 'YELLOW FOXGLOVE'. Light yellow 2" flowers marked brown, in spikes. Hardy perennial or biennial to 3 feet. Eurasia. Zone 3. Germinates in 2 - 3 weeks. 'STRAW FOXGLOVE'. 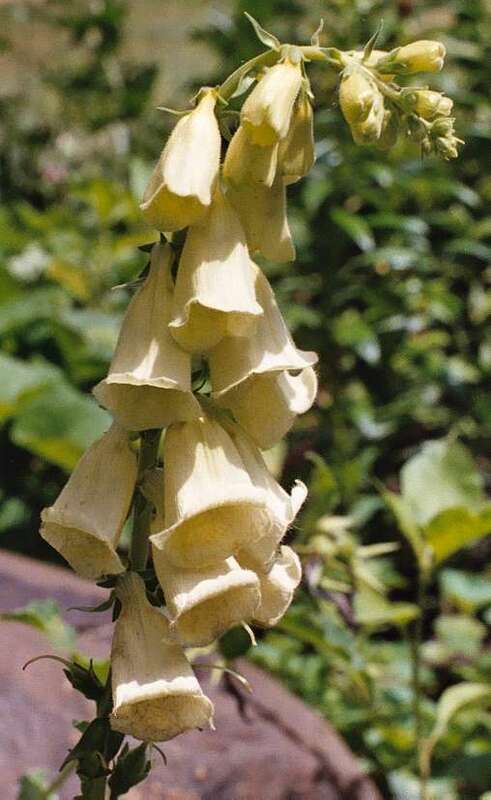 Yellow to white inch-long bells in spikes to 2 - 3 feet tall, summer and fall. Hardy perennial with dark green leaves. Europe and N. Africa. Zone 4. "A noteworthy, graceful, long-lived, lime-loving species. "—Jelitto and Schacht. Very large crushed-strawberry colored 2" flowers in May and June. Showy hardy perennial to 2 - 3 feet, with glossy dark green leaves. Europe. Zone 3. A stable hybrid from D. grandiflora X purpurea. 'WILLOW-LEAVED FOXGLOVE'. Yellow, red-veined or orange-red flowers. Slightly woody perennial to 2 feet, with narrow, willow-like foliage. Spain. Zone 4. Dry, well-drained areas. Germinates in 1 - 4 weeks. 'LITTLEFLOWER FOXGLOVE'. Small red flowers on a pretty little plant to 2 feet. Europe. Pure white flowers with spots. An excellent variety. Unique apricot-pink-orange flowers in long spikes. To 4 feet. Good for cutting. Germinates in 1 - 2 weeks. Outward facing flowers all around the stem makes for a nice display of the inner markings. Various shades of purple, pink, carmine, creamy, etc. Long spikes. 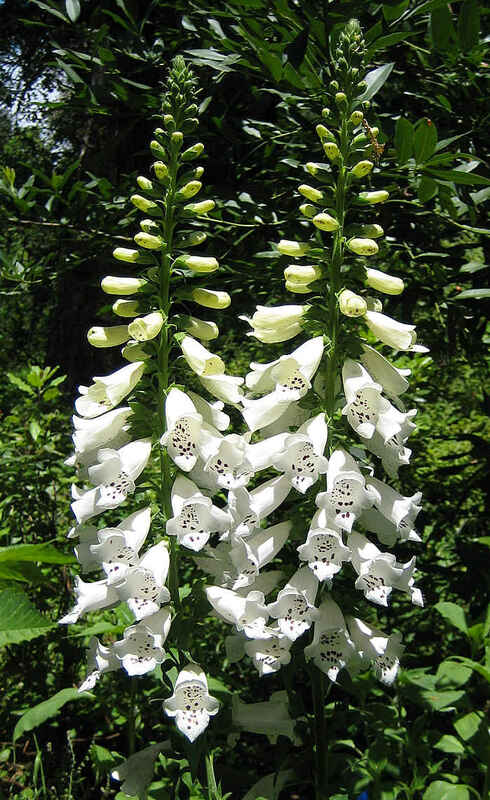 The first annual foxglove developed, a Silver Medal winner in the 1966 A. A. trials. Blooms in just 5 months from seed, with large, spotted, red, rose, white or yellow flowers in dense spikes. Start early for June bloom at 18" tall, reaching 3 feet. Creamy white flowers with deep burgundy throats in June to August. Hardy biennial to 4 feet. Zone 5. 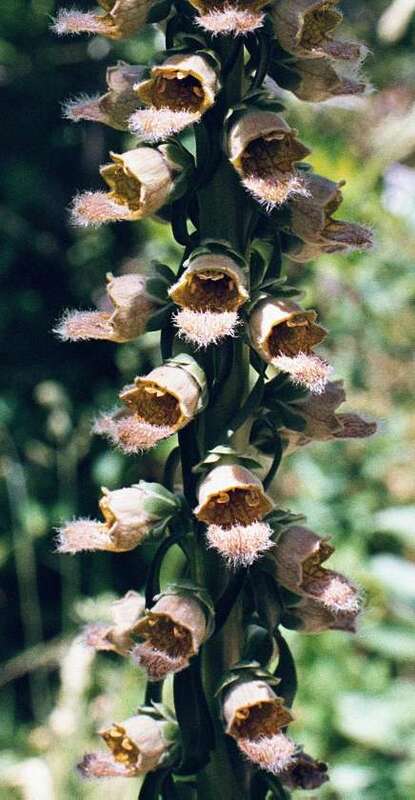 One of the finest, a giant variety to 5 feet, sometimes towering to 9 feet, with long, dense spikes of richly spotted and blotched flowers in rich shades. Developed by Rev. Wilkes, the Shirley poppy man. 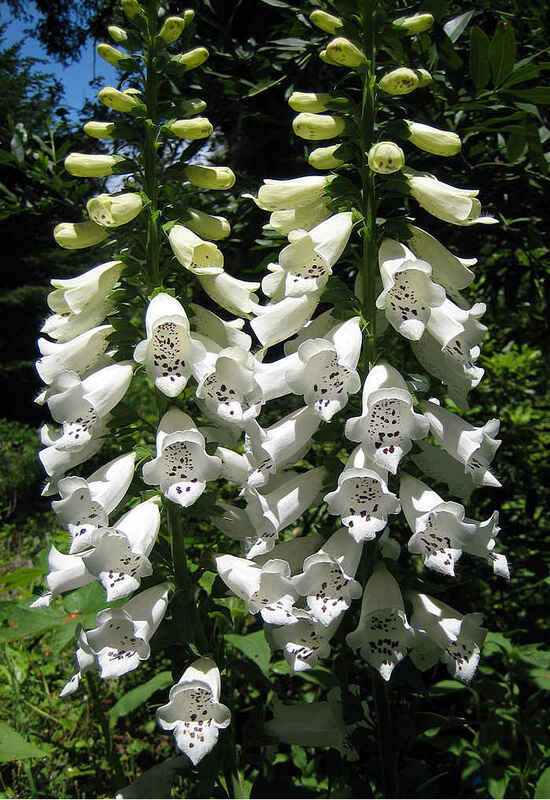 A stunning foxglove with spikes of large pure white, unspotted flowers, May to July. To 3 feet. Good for cutting. 'COMMON FOXGLOVE'. Purple, mottled 3" tubular flowers in one-sided spikes to 2 feet long. Spectacular hardy biennial to 4 - 7 feet, with a large basal rosette of downy, foot-long leaves the first year. Europe, naturalized in North America. Zone 4. Good in moist shady places. Used medicinally as a cardiac tonic and stimulant. Bees like it. Germinates in 1 - 2 weeks. 'HELEN of TROY'. Yellow to amber-brown flowers with white lip and brown and gold-netted throat. Dark green narrow leaves. Biennial to 3 feet. Turkey. Zone 6. Germinates in 1 - 3 weeks warm. LEGUMINOSAE, tribe: MIRBELIEAE. Attractive small Australian endemic heath-like shrubs with yellow and red pea-like flowers. Of diversity sampling interest. 'PRICKLY PARROT-PEA'. Yellow 1/2" flowers with red markings. Small shrub to 3 - 6 feet, with small needle-like leaves. Resembles a juniper. SE Australia. Stands drought. Good in California. Nick seed to germinate in 2 - 4 weeks. Zone 9. 'SHOWY PARROT-PEA'. Apricot flowers with red centers, sometimes yellow or pink, in dense, spike-like clusters in spring. Small shrub to 3 feet, with needle-like leaves. E. Australia. Zone 8 or 9. Good in tubs. Nick to germinate in 2 - 4 weeks. DIOSCOREACEAE. Some 600 species of twining herbaceous vines rising from tubers. Some edible, others poisonous or medicinal, yielding cortisone and progesterone precursors. Most are easily grown in deep well drained soil. 'CINNAMON VINE', 'YAM', CHINESE P0TATO'. Cinnamon-scented white flowers and heart-shaped, shining leaves. Tall perennial climber to 10 - 30 feet. Philippines. Hardy to New York, Zone 4 or 5. Forms large edible tubers Co 3 feet long, deep in the soil. Easy from the small tubers that form at the leaf-axils. Packet of tiny tubers. May be a bit weedy in some areas. This may be Dioscorea bulbifera. EBENACEAE. A large and wide-ranging genus of trees and shrubs, grown for ornament, fruit, timber. 'DATE PLUM'. Small round cherry-sized yellow fruits turn blue-black when ripe. Eaten fresh, dried, or bletted like medlars. When dried they taste a bit like dates. Handsome deciduous tree to 25 - 40 feet, with 5" leaves. Asia. Zone 5. Germinates in 1 - 3 months with no prechill needed. 'AMERICAN PERSIMMON'. Round yellow or orange 1 - 2" edible fruits. Deciduous tree to 40 - 100 feet, with dark green shiny 6" leaves that give good fall color. Connecticut to Texas. Zone 4. Ripe fruit eaten fresh or dried, made into molasses, beer, and bread, and seeds roasted for a coffee substitute. IRIDACEAE. Two Iris-like species from Australia. 'BUTTERFLY' or 'WHITE FLAG IRIS'. Fragrant white 1 1/2" flowers flushed lilac. Iris-like plant at 1 1/2 - 3 feet, with narrow leaves. S. Australia. Long bloom period. Germinates in 2 - 20 weeks. PRIMULACEAE. 'SHOOTING STARS'. Beautiful N. American and Siberian perennials with attractive flowers. Grown in well drained soil in the wild or rock garden. Name means 'twelve gods'. It is said that the 30 species may all be a single, variable species. Most germinate readily after 6 - 8 weeks cold treatment, some without cold. Seed half-life 6 years. 'SHOOTING STARS'. Beautiful small nodding flowers in clusters, in shades of white, pink, red, and lilac, May to June, on stems to 16". Hardy perennial woodland plant. N. America. Zone 3. Prechill seed 8 weeks. SAPINDACEAE. Widespread warm-region evergreen trees and shrubs with ornamental foliage and winged pods. Good in arid regions. Seed long-lived. Ferny pinnate dark green to bronzy, downy foliage. Clusters of pink to red to purple winged 3/4" pods in summer. Attractive upright shrub to 6 feet. Australia. Good in California. Nick seed to germinate in 2 - 10 weeks. LEGUMINOSAE. Fast growing tropical annual and perennial twiners with attractive Wisteria-like flowers and pods. Blooms freely from July to October. Grown for food, forage, ornament, and analytical work. Likes warm, rich, moist soil. In the greenhouse, they can be flowered three to an 8" pot. Soak seed till swollen, hot water may help. Sow indoors in pots in March to germinate in about 1 - 3 weeks. Plant out in warm weather. Seed viable 4 - 10 years. 'HYACINTH BEAN'. Showy large purple Wisteria-like 3/4" flowers in upright 6" spikes, followed by 2 1/2 - 5" pods filled with dark seeds. Large broad leaves. Tender perennial to 10 - 20 feet, grown as an annual in the U.S. Eagerly grazed by cattle, sheep, pigs and goats, excellent green manure and erosion control. Adapted to 8 - 100" precipitation, many soil types, and is nitrogen fixing. The ripe seeds contain 20 - 28% protein, and are boiled for food (the water discarded), or sprouted like mung. Young green seeds eaten cooked, and immature pods are an excellent table vegetable. Young leaves cooked like spinach, and the flowers are eaten raw, steamed, or added to soups. The large, starchy root is said to be edible. Soak, nick unswollen, to germinate in 1 - 3 weeks. AIZOACEAE. Annual succulents grown for their showy white, red, yellow or pink flowers and curious, crystalline leaves. Excellent for bedding and borders, thriving in poor dry soil and full sun. Sow in March, barely cover seed. Germinates in about 1 - 2 weeks. Plant out in May. Flowers in 3 months. AGAVACEAE. Tropical, mostly African Yucca-like trees and shrubs. Good in California. 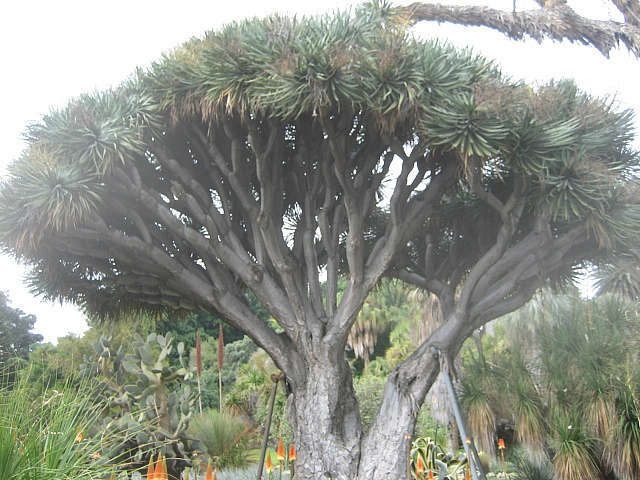 'DRAGON -TREE', 'DRAGON'S-BLOOD TREE'. Narrow sword-like 2 foot grey-green leaves in large round heads. Slow-growing tree to 70 feet, with a broad crown and clusters of flowers followed by red berries. Thick trunk. Canary Islands. Zone 10. Reaches great age. Endangered in habitat, but cultivated and naturalized elsewhere—preservation through dissemination. Germinates in 1 - 3 months. COMPOSITAE. A single species related to Rudbeckia. 'CONE-FLOWER'. Deep yellow 2" flowers, often with purplish at the petal-bases, and a dark brown inch-high central cone. Handsome annual to 3 feet, with clasping pointed leaves. SE U.S. Germinates in 2 weeks, much improved with GA-3. 'TRIANGLE PALM'. Striking palm with fronds in three ranks, forming a triangle-shaped trunk. To 30 feet, with bluish-grey 15 foot fronds. Southern Madagascar. Zone 9b. CITES Appendix II endangered species. Good in tubs. Needs warmth to germinate in 1 - 2 months or so.